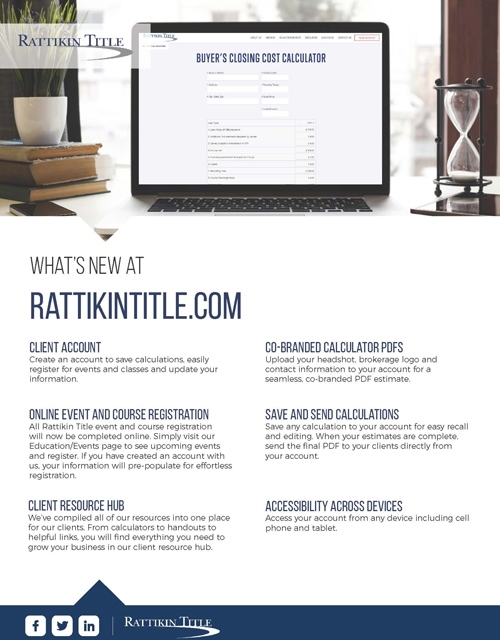 We are pleased to release the all new Rattikin Title Website! Our goal with this new website is to provide you, our clients, with the most effective, cutting edge and user-friendly tool to help you build your business. Client Account: Create an account to save calculations, easily register for events and classes and update your information. Online Event and Course Registration: All Rattikin Title event and course registration will now be completed online. Simply visit our Education/Events page to see upcoming events and register. If you have created an account with us, your information will pre-populate for effortless registration. Client Resource Hub: We’ve compiled all of our resources into one place for our clients. From calculators to handouts to helpful links, you will find everything you need to grow your business in our client resource hub. Co-Branded Calculator PDFs: Upload your headshot, brokerage logo and contact information to your account for a seamless, co-branded PDF estimate. Save and Send Calculations: Save any calculation to your account for easy recall and editing. When your estimates are complete, send the final PDF to your clients directly from your account. Accessibility Across Devices: Access your account from any device including cell phone and tablet. We hope you enjoy our new website and find it an invaluable tool.